Federal employees who pass through the revolving door with the private sector and engage in other actions that could present conflicts of interest would come under intensified scrutiny in a slew of reforms House Democrats introduced on Friday aimed at boosting ethics oversight in government. The new House majority put forward the For the People Act (H.R. 1) as its first legislative priority, after the more immediate concern of reopening the full government. The package involves an array of issues House Speaker Nancy Pelosi, D-Calif., said were critical to “restoring integrity in government,” such as voting rights access and campaign finance changes. It would also place new restrictions on federal workers before, during and after their government service, with special obligations for senior officials and the president. All federal employees would face a ban on using their official positions to participate in matters related to their former employers. Violators would face fines and one-to-five years in prison. Agency heads, in consultation with the director of the Office of Government Ethics, could issue waivers if it were deemed in the public interest. Contracting officers at federal agencies would face a two-year ban on receiving any compensation from companies to which they played a role in awarding a federal contract. That would double the current cooling-off period, as well as add any affiliates and subcontractors associated with those companies. Procurement officials would also have to report any job offers their relatives receive from companies to which they have awarded contracts. Employees would face a two-year ban on any involvement with contracts involving former employers. The bill would also serve as a reauthorization measure for the Office of Government Ethics. It would make it harder for the president to fire the office's director. It would also give the agency more leeway in launching and conducting investigations and more teeth in enforcement, including through disciplinary action for ethics violators. The measure would double the prohibition on senior officials in the Executive Schedule from attempting to influence employees at their former agencies from one year to two. It includes a “sense of the Congress” that the president and vice president should be subject to federal conflict of interest laws and would prohibit the president from contracting with the government. The Trump Organization’s contract with the General Services Administration to operate a hotel out of the Old Post Office Building in Washington, D.C., has been subject to much controversy and multiple investigations. Citizens for Responsibility and Ethics in Washington, which has repeatedly sued Trump and members of his administration over allegations of conflicts of interest, praised the measure as a “tremendous step in the right direction” but said in some areas, the measure did not go far enough. The measure should have done more to override Trump’s decision to allow his business to continue to operate while in office, CREW Executive Director Noah Bookbinder said. “That decision has resonated throughout his administration, creating constant risks that the president’s own decision-making will be affected by his financial interests; exposing thousands of federal government employees to corruption risks as they are forced to interact with his businesses; and setting a tone from the top that has allowed his Cabinet members and other senior appointees, including his own relatives, to ignore their own ethical obligations,” Bookbinder said. 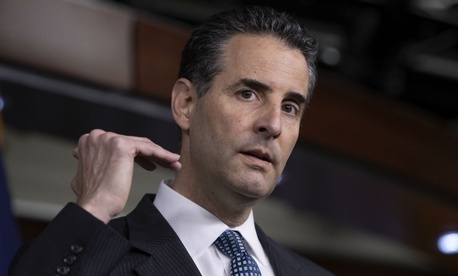 Rep. John Sarbanes, D-Md., the bill’s lead author, said Democrats' sweeping House victories in November were in part due to their promise to clean up corruption in Washington. “The bold, transformative set of reforms that we introduced today will strengthen our democracy and return political power to the people by making it easier, not harder, to vote, ending the dominance of big money in our politics and ensuring that public officials actually serve the public,” Sarbanes said.